A man who attended the “Unite the Right” rally in Charlottesville, Virginia, with members of a neo-Nazi organization, has been charged with terrorism offences after he tried to derail a passenger train. Taylor M. Wilson, of St. Charles, Missouri, was arrested by federal law enforcement officials on October 22, after he attempted to sabotage a passenger train with 175 people aboard in rural Nebraska. According to the Federal Bureau of Investigation, Wilson entered the train’s engine room and pulled the emergency brakes, thus bringing the train to a sudden halt. He was eventually subdued by a train conductor and other railway employees, who successfully prevented him from reaching for a loaded revolver that he had with him. Following his arrest, police found in his backpack a box of ammunition, a knife, a hammer, and a full-face respirator mask with a filter. Now the FBI says that Wilson boarded the train intent on carrying out a terrorist assault, and that he pulled the train’s breaks “with intent to harm those aboard”. In court documents that were unsealed last week, FBI agents state that a search of Wilson’s property in Missouri uncovered a large weapons cache consisting of fifteen firearms, some of which were automatic. Nearly 1,000 rounds of ammunition were also confiscated from Wilson’s house, where federal officers also found literature published by American white supremacist organizations like the National Socialist Movement. According to the indictment, some of the weapons and white nationalist literature had been hidden inside a concealed compartment located behind a refrigerator unit. It appears that Wilson obtained most of his firearms legally and that he had been issued a concealed carry permit. However, the FBI claims that Wilson’s firearms “have been used for, or obtained in anticipation of engaging in, or planning to engage in, criminal offenses against the United States”. In addition to this claim, the FBI indictment states that Wilson traveled to Charlottesville, Virginia, in August of last year to attend the “Unite the Right” rally, which was organized by various white supremacist, white nationalist, neo-Nazi and militia groups. The FBI says that it has statements from Wilson’s associates and at least one family member, who claim that the accused traveled to Charlottesville as part of a contingent of a neo-Nazi group. Comment: Are US Authorities Ignoring Far-Right Terrorism? Last month I gave a radio interview on a show syndicated on National Public Radio stations in the United States, in which I warned that American far-right extremism is growing faster than any other time since the rise of the second Ku Klux Klan in the 1920s. I specifically pointed the finger at an increasingly dangerous mix of gun culture, neo-Nazi ideology, and white-nationalist interpretations of Christianity, known collectively as Christian Identity. In the post-9/11 world, many in the West tend to be forgetful of incidents like the neo-Nazi-inspired 1995 Oklahoma City bombing —the largest terrorist attack on US soil prior to 9/11. Even recent high-profile cases, such as the 2011 Norway attacks by neo-Nazi Anders Breivik, who killed 77 people in Oslo and Utøya, have proven unable to challenge that dangerous amnesia. It follows that last Sunday’s mass shooting at a Sikh temple in Oak Creek, Wisconsin, which left seven people dead and three injured, including a police officer, poses a long-overdue opportunity for reflection. ►►NSA head claims Americans’ emails ‘won’t be read’. The House of Representatives in April approved a bill that would allow the government and companies to share information about hacking. Critics have raised privacy concerns about the sharing of such information, fearing it would allow the National Security Agency, which also protects government computer networks, to collect data on American communications, which is generally prohibited by law. But in a speech at the American Enterprise Institute, NSA Director Keith Alexander said that the new law would not mean that the NSA would read their personal email. ►►German spy chief quits in neo-Nazi files scandal. The head of Germany’s domestic intelligence agency, the Verfassungsschutz, Heinz Fromm, resigned last week, after admitting that his agency had shredded files on a neo-Nazi cell whose killing spree targeting immigrants rocked the country late last year. The “National Socialist Underground” (NSU), which went undetected for more than a decade despite its murder of 10 people, mostly ethnic Turkish immigrants. German media have said an official working in the intelligence agency is suspected of having destroyed files on an operation to recruit far-right informants just one day after the involvement of the NSU in the murders became public. 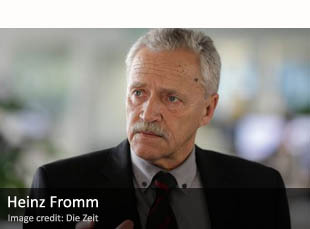 Fromm had led the Verfassungsschutz since 2000. ►►US spy agency accused of illegally collecting data. The US National Reconnaissance Office (NRO) is pressuring its polygraphers to obtain intimate details of the private lives of thousands of job applicants and employees, pushing the ethical and legal boundaries of a program that is designed to catch spies and terrorists, an investigation has found. The NRO appears so intent on extracting confessions of personal or illicit behavior of its employees, that its officials have admonished polygraphers who refused to go after them and rewarded those who did, sometimes with cash bonuses. And in other cases, when it seems the NRO should notify law enforcement agencies of its candidates’ or employees’ past criminal behavior, it has failed to do so.